US troops in chemical weapons suits, Kuwait, Iraq. PA / PA Archive/Press Association Images. All rights reserved.In both the United States and Britain, there is passionate contest over the legitimacy and honesty of government attempts to justify war with Iraq, especially claims of the existence of active Iraqi chemical weapons programmes. In an interview of profound insight, the man responsible for chemical weapons destruction operations in Iraq from 1991-94 talks to Anthony Barnett and Caspar Henderson about the true extent of Iraq's capacity to produce, store and deliver weapons of mass destruction. 1. Was Iraq able to deploy weapons of mass destruction in 2003? openDemocracy: When the British government said in its dossier of September 2002 that Iraq had weapons of mass destruction (WMD) that could be used within 45 minutes, what sort of evidence could that be based on? Ron Manley: I have no idea. I did find it surprising. The trouble is statements are often made and then become reinterpreted. Was it theoretically possible? The answer is yes. But likely? That’s a different matter. openDemocracy: The British government document states that Iraq did have these things, not that it might have them. Ron Manley: Like everybody else, I read the dossier. My assessment was that the Iraqis could have some chemical weapons (CW) – indeed, I’m surprised that they have found absolutely nothing so far – but not militarily significant ones. There is one grey area, which could have possibly justified the 45 minutes story. That is, whether they had stored binary materials. Iraq had developed a means to make the binary agents for sarin (GB) and cyclosarin (GF). The precursor chemicals for these agents are relatively stable. They could be stored in something as basic as plastic jerry cans, before being mixed together to produce the toxic chemical agent. openDemocracy: Can we press you on this. Suppose I am representing the prime minister and I have been asked to assess the actual, present military threat from Iraq. It’s clear they don’t have nuclear weapons. On biological weapons the evidence is very thin. But we know that they produced and used massive quantities of chemical weapons before 1991. So I want to know whether there is a serious imminent threat. What conclusion would I come to? Ron Manley: These binary agents were crude and not very effective, but they could, in theory, be used as follows. You find yourself an empty aerial bomb, and you tip the two lots of chemicals into the bomb, screw on the cap, roll it around the runway for half an hour or so, load it onto an aircraft, and by the time you arrive at the target you would probably have 40-50% nerve agent inside that weapon. You’re not talking about hundreds of bombs; you’re talking about ones and twos. That is the only credible scenario I know of. We’ve not found any binary precursors yet, but they may have hidden some. But I don’t know anybody who seriously believes that the Iraqis have had militarily significant CW capabilities since 1991.
openDemocracy: You’re talking about a handful of bombs. There are many risks around in the world greater than that. Ron Manley: Absolutely. A key question is what happened in Iraq in the four years from December 1998, when UN inspectors left, to their return in 2002. Even if the Iraqis had hidden some useable chemical agents and filled chemical weapons, these would have deteriorated over time. If they were continuing to produce weapons, then where were they doing it and where were they filling them? That’s what everybody is waiting to hear. openDemocracy: The British government’s assessment refers to intelligence findings that such processes were being revived – for, example at the Ibn Sina company at Tarmiyah, and at the al-Qa’qa’ complex south of Baghdad. Ron Manley: It does. But the sites you mention were visited both by UN inspectors, immediately before the war and subsequently by the US military; neither found evidence that any production had taken place. The point is that production of these materials on a large scale really is not something you can easily hide. You could hide the individual items of equipment or the raw materials in, say, Saddam’s massive palace complexes. But when you actually start to build a plant and manufacture chemical agents it’s a whole different story. My view has been all along that they didn’t retain any militarily significant quantities of chemical weapons. My view has been all along that they didn’t retain any militarily significant quantities of chemical weapons. A terrorist attack – the ability to fire the odd al-Hussein missile at Saudi Arabia, say – would be a different matter. They could probably have done that. I must admit I am amazed that they haven’t yet come across the odd CW-related item because I find it incredible that none of the programme was left. openDemocracy: Suppose they did send off one missile with 300 litres of nerve agent in it, and hit a city. What would the damage be? Ron Manley: The accuracy and effectiveness of the CW-filled al-Hussein missiles is highly questionable. The most likely outcome would be widespread panic. Even in a CW terrorist attack, the greatest danger is panic. Look at the Tokyo subway incident where the actual deaths were something like eleven, and the injured and incapacitated – largely from the panic – were about 5,000. The real point of such weapons is terror, not military until you talk large numbers. Nevertheless, one should not underestimate the effect of panic. If even just one chemically armed missile were fired at, say, Tel Aviv, the panic would probably be tremendous. But we cannot know for sure. That is why everybody still wants to know exactly what the Iraqis had. The Iraqis relied on impact fuzing rather than proximity fuzing. That means that the missiles would function only on impact not, say, 50 metres or 100 metres up where the agent could be dispersed more effectively. So if it hit a building, for example, and then went off most of the agent would be destroyed with the warhead. Some would survive and spread out, but a lot of it would be buried down in the rubble. openDemocracy: Can you say categorically that the Iraqis did not have proximity fuzing and never acquired it? Ron Manley: We never found any evidence of proximity fuzing. I wasn’t there after 1995, of course, so I can’t say from direct experience what they did after that, but I haven’t seen any reports that they had acquired proximity fuzing technology. openDemocracy:Given your experience in the country, did the government or the intelligence agencies come to you as part of their overall assessment and ask you for your input? Ron Manley: No, not since I retired. I still do occasional work for the ministry of defence (MoD) and other government departments but you need to understand that once you retire you move out of the system. Part of the problem is that you can count on the fingers of two hands the number of people within the Nato alliance who actually have a real practical knowledge of these issues. It’s therefore highly probable that most of the people in the intelligence services these days do not have such knowledge. For example, I’m the youngest person in the United Kingdom, as far as I am aware, to have worked with bulk chemical agents, and I’m over 60. It’s also often said that if you take five intelligence officers and show them a room, they’ll come up with five different answers as to what takes place in it. You have to be on the ground to actually be sure what’s happening. But people on the ground sometimes tell you what you want to hear. Iraqis are no different from anyone else in this respect. So you also need to test what they say with people who have been there and know them. 2. The making of a weapons expert. openDemocracy: Could we now go back to the beginning: how did you first come into contact with chemical weapons? Ron Manley: I joined the British Ministry of Defence in 1960 and was posted to the Chemical Defence Establishment at Nancekuke in Cornwall. It was originally designed to be the production facility for UK chemical weapons, but in 1956 the UK gave up its offensive capability and just maintained a research one. When I joined in 1960 they were largely concerned with development work rather than production and research on VX was underway. One of my first jobs was to work on the development of the manufacturing process for VX. VX is the code name for o-ethyl S-2- diisopropylaminomethyl methylphophonothiolate. As you can see it’s a very complicated name and that alone might be sufficient to kill somebody. VX is a nerve agent discovered in the 1950s. It was developed from a pesticide called Amiton, which was being produced by ICI. Some people at Porton Down modified it to create a new agent about ten times more toxic than the G-agents. It’s lethal by both inhalation and skin permeation. In the 1960s, it was the most toxic agent in the Nato and Warsaw Pact arsenals. As the United Kingdom had given up offensive chemical warfare capabilities our research was shared with the Americans. They put VX into production and made and weaponised large quantities – in thousands of tons – which are currently being destroyed in accordance with the requirements of the 1992 Chemical Weapons Convention (CWC). There was still a lot of work being undertaken on the stabilisation of agents, novel compounds, antidotes and so on. Then, when the decision was taken in the 1970s to eliminate all remaining stocks of UK material – the UK still had some twenty tonnes of the nerve agent sarin, for example – I was one of the people who worked on the programme to destroy them. We started in about 1974 and by 1978 the work was virtually complete. Ron Manley: If you have the right people, properly trained – and we did – then it is not difficult. The chemistry is simple. The challenge is in physical handling. For example, in 1976-78 we dismantled the pilot plant, which had been used for making GB, another nerve agent. This plant had been decontaminated and mothballed almost twenty years earlier. But we were still able to detect trace quantities of the agent. We had to take it apart very carefully, piece by piece, nut by nut, flange by flange. This had to be done in full protective gear and with all the support equipment – ventilation and filtration systems, a medical centre, the works. You have to be extraordinarily careful undertaking such operations. If you bring any contamination out of the contaminated area you’re a risk to others as well as yourself. One cannot underestimate the skill level that you require to be able to do this on a significant scale. It would have been much more difficult for us to do that without the core workforce that had been trained when they were making the stuff, and they could pass the skills on. This was one of the lessons I took with us when Unscom went into Iraq. openDemocracy: So after this decommissioning you went to Unscom? Ron Manley: No, first I went to Porton Down in 1978 and until the early 1990s worked on process chemistry, but on the defensive side. I was one of the project officers for the auto-injector, one of the nerve-agent treatment regimes. I also was responsible for overseeing the construction and operation of the hazardous waste incineration facility at Porton Down. And I was an adviser on the construction and the design of facilities for handling very toxic biological as well as chemical materials because by then CDE (Chemical Defence Establishment) had become CBD (Chemical Biological Defence), and was looking after biological weapons defence as well. 3. UNSCOM – the inside story of chemical weapons destruction. Ron Manley: Unscom (United Nations Special Commission), was founded in April 1991 under the Security Council ceasefire resolution, SCR687, to deal with the destruction and elimination of Iraq’s WMD programmes. Twenty-one countries nominated twenty-one academic experts or senior diplomats to serve as commissioners. They realised after their first meeting that they had a problem. They had absolutely nobody on the commission who actually knew anything about how to destroy chemical weapons. By that time they knew the extent of the problem in Iraq and that they had to do something about it. So ambassador Rolf Ekeus, the chairman of Unscom, asked a number of countries with the necessary experience to put forward experts. For my sins I was nominated as the UK representative. I was asked to chair what they called the Destruction Advisory Panel. This was set up in June 1991, not long after the end of the war. Over the next four years between 1991 and 1994 we visited Iraq repeatedly, assessed the problem, developed and implemented solutions and provided a whole series of reports and advice to Unscom on how to go about safely destroying these chemical weapons. openDemocracy: So you were in charge of making sure that Iraq’s chemical weapons were destroyed? Ron Manley: Yes. First, we looked at three options for disposing of the weapons. We could try to ship them out of Iraq. But this was a bad idea. There were huge amounts of stuff lying around all over the place, much of it damaged, a lot of it leaking. It simply wasn’t practical. The second option was to bring in teams of experts to do it. We looked at that, but the expertise wasn’t readily available, and even if it had been there would have been a lot of potential problems associated with having a large number of foreign workers based in Iraq for several years. The third choice was to get the Iraqis to do most of the work under UN supervision. That’s what we did in the end. We set up a team of about one hundred people from twenty-five countries to supervise the Iraqis over what turned out to be a nearly three year operation. The advisors were mostly military people with what we call an NBC (Nuclear, Biological, Chemical) background. They were not chemical weapons experts. They were people who had been trained in defence against biological and chemical weapons. All nerve agents are highly toxic and extremely difficult to handle safely. I’ve heard people suggest that the Iraqi authorities would be reckless because they would have an attitude that you can always replace workers. I don’t agree. In the UK it took about two years to train someone to work safely with these materials. So if you just kept writing people off every other week there would be nobody left to do the job. The Iraqis may have been somewhat cavalier by western safety standards, but that doesn’t mean they were totally reckless. I remember talking to the Iraqis back in 1991 about accidents and incidents. They said they had occasional cases of miosis, which is one of the initial symptoms of nerve agent poisoning, and sometimes people got a tight chest, which is another symptom. If you had ever spoken to anybody on an American or UK plant in the 1950s you would have probably got a similar answer. openDemocracy: So how did you set about destroying them? Ron Manley: First, we had to decide where to destroy the weapons. We chose Al-Muthanna, the site where they produced their materials in the first place. The infrastructure had been heavily bombed, and much of the facility was devastated, but it was a remote location and the trained people were still there. Then we arranged to move the weapons from the various stores and airfields around Iraq to Al-Muthanna. We had to develop new ways to move these things. In a few cases where it was simply too dangerous we had to develop methods to dispose of them safely and expediently where they were. But the vast majority were brought back. In the case of the mustard gas we decided on incineration. That’s how the Americans are doing it, for example. There was no incinerator in Iraq even remotely capable of doing something like this. We helped the Iraqis to design one, and they built it, remarkably well, in just nine months. We introduced a number of safety features, which were not common to the Iraqi way of life. We put a permanent monitoring team on the site and they supervised the destruction of the mustard gas over the next two to two-and-a-half years. With nerve agents we used hydrolysis, treating them with a chemical to break them down into non-toxic waste. They had a pilot plant for producing Sarin, one of their nerve agents, which had been hit by a 1000-kilogram bomb that had not gone off. The Iraqis managed to extract the bomb and we then turned the plant from a production facility into a destruction facility. He could see that the political window was going to close. So we had to take some measures, which, while not unsafe, were not as environmentally friendly as they could have been had we had more time. For example there was a 122mm rocket with two polyethylene containers for the chemical agents inside an aluminium warhead mounted on a rocket motor and a fusing system. We looked at many ways to disassemble it. The risks were horrendous, and our philosophy from day one was that we would not put an Iraqi in any position that we were not prepared to put ourselves in. It was going to be totally impractical to disassemble these rockets. The Americans have a similar sort of rocket called the M55 and the way they solved the problem was to build a $600 million plant on Johnson Island and another in Utah, where, inside full containment facilities, they guillotined their rockets by remote control. But to build a facility like that would have required five to six years and would have been equally expensive. So instead we developed something called instantaneous thermal degradation. Some people say we simply blew them up! This is not true. What we did was to dig holes deep in the ground (if one of these rockets fires it will go 25 kilometres) and put a tank in the bottom. We put diesel fuel in the tanks, and on top of each of the tanks we laid up to twenty rockets. Then we attached small charges on three points of the rocket. The first was to cut off the guidance part of the rocket, the second charge to punch one of the agent containers, and the third to punch the other. All detonated remotely. This caused the agent to drain into the diesel fuel, which, a few seconds later, was ignited by another charge. The result is a fuel-air explosion. We showed that the temperature inside that cloud is about 2000 degrees centigrade – easily enough to decompose any agent. And to make sure that there were no significant releases of agent we set up sampling arrays at 100 metres and 200 metres downwind. We showed that you could stand for eight hours at a 100 metres downwind and you would not get exposed to sufficient agent to cause you any problem. openDemocracy: How many rockets did you destroy? Ron Manley: Several thousand. It was a torturous, long, difficult process, with people – UN personnel and the Iraqis – working in temperatures of up to 50 degrees centigrade, but we had absolutely no other way to do it. I remember saying to the Iraqis ‘Now who’s downwind of this?’ And they said nobody. And we looked at the map, and no doubt about it, this is in a part of western Iraq where the nearest thing is Syria, around 50-100 kilometres away. But to be safe we decided that we would fly a helicopter downwind before we did the first trial. And there’s these guys herding sheep about 20 kilometres downwind. And we say to the Iraqis, ‘but you said there’s nobody there!’ And they said, ‘well, they’re only nomads’. After that, before every firing, we flew a helicopter downwind to check that it was clear. But those rockets were an exception. In the vast majority of the cases – such as the 12-14,000 artillery shells – we emptied every one of them. All the aerial bombs and missile warheads were emptied, and all the bulk tanks were actually treated. In the case of the incineration there is no waste because it’s all been burnt. In the case of the nerve agent decomposed by hydrolysis you end up with a relatively non-toxic salt solution. In various countries they had different ways of dealing with that. In the UK, for example, we disposed of it at sea because essentially it’s no different from what you’d find in salt water. But in the Iraqi desert we created big concrete pans, dried it out, scooped it up, mixed it with concrete, and stuck it inside one of the huge bunkers at Al-Muthanna and sealed it off. Everything was done as best we could to minimise any potential environmental damage. openDemocracy: To produce all this material the Iraqis must have had quite significant production capability. Ron Manley: Absolutely. Al-Muthanna was a huge site. The inner boundary was 5 km by 5km. Within this were twenty or thirty plants. You see, they had to manufacture the intermediates as well as the final products. Indeed, in general you can’t even buy the precursors for these chemicals on the commercial market, and when you’re Iraq and you’re trying to buy them covertly you have to use all kinds of peculiar routes. There were also three satellite sites which were ‘dual use’ – making legitimate stuff, but making precursors as well. So yes, it was a huge complex. Even when we were there we were employing around 200 chemists and chemical engineers. In its heyday they would have employed a lot more. They had a huge filling plant, where they filled the shells with the chemical agents, located downwind, very wisely – outside of the actual production area. It was hit by around eight cruise missiles on 15 January 1991. At that time there was nobody on the site. The Iraqis told us that they knew what was coming, and they’d all left. But the day before they had been filling 122 mm rockets with nerve agent in this plant, and they’d left, leaving some of the rockets part-filled, others filled, and some of the material there in bulk. When we got there in June the place was an absolute nightmare because there were fuses lying all over the floor, there were half-rockets hanging out of the ceiling where they’d been blasted by the explosions. openDemocracy: Presumably there were nerve agents also in the atmosphere and the fabric? Ron Manley: Absolutely. All over the place. That was one of our major problems, and another reason why we couldn’t take too long over the destruction. The longer we took to destroy them the more agent was going to leak into the atmosphere. This could hurt people on site. The risks to the general population were very small because the plant is very remote, but obviously we didn’t want it to go on longer than we could help. openDemocracy: And there were no other major production facilities in Iraq? Ron Manley: There was another facility called al-Rashad, near Baghdad, but as far as we were able to establish, that was purely for research purposes. There was a big storage facility in Mohammediyat, and they were in the process of building, a second filling plant there. But this was an above ground facility with lightweight structures and it had been severely bombed. openDemocracy: How frank or secretive were the Iraqis you dealt with? Ron Manley: That depended on which Iraqi you talked to. Were they being devious? Of course. At the highest levels, they were being incredibly devious. With respect to destruction we had extremely good co-operation, though, all the way along the line. They did what we asked them to do, on time and they did it to the best of their ability. Having said that, you could argue this was because they knew how big a problem the wrecked facility and the damaged weapons were. When you inquired about the CW programme, it was a different story. Let me give you an example. A chap called Jim Knapp, a Canadian, and I wanted some drawings of Al-Muthanna. We really pushed General Bilal, a senior general who was responsible for the site, to get the drawings. And at one stage the guy was breaking out into a sweat and shaking, and our UN interpreter took us aside and said look, you are going to have to stop or he will have a heart attack. He was terrified, clearly, that if he gave something away…you can imagine. openDemocracy: How much of the Iraqi chemical weapons capability had been neutralised or destroyed, by the time the Unscom programme stopped in 1994? Ron Manley: The generally accepted figure is that at least 95% of the capability had been removed. We had accounted for a lot of the dual purpose chemical equipment, and what hadn’t been destroyed was under constant surveillance. We accounted for almost all of the agents, even though the figures never quite added up. Realistically, there was always going to be some stuff left lying around, the odd warhead and certainly some precursor chemicals. But we were confident that we had got the vast majority of the material, not least because nerve agents decay quickly unless they are very pure and stabilised. When the Americans, British, or Russians made nerve agents, for example, they needed them to be stable for five to ten years, so as to last inside the weapons systems. But purifying and stabilising nerve agents is extremely difficult. Iraqi agents were extremely unstable. After twelve months in storage, for example, they would still be dangerous and kill some people, but they would only be about 1-5% as effective as when they were first made. openDemocracy: The British government’s September 2002 dossier says that, by that time, Iraq had the technology to stabilise nerve agents and other chemical agents. Ron Manley: I know what the dossier says and I agree that they understood the principles of stabilisation of chemical agents. I am not aware, however, that we have any evidence that they actually put this knowledge into practice. Before you can stabilise a nerve agent you have to make it more than 95% pure, and we have no evidence of any kind to suggest that Iraq could produce agent to that standard. openDemocracy: What standards of purity were they producing when you were there? Ron Manley: About 60-70% at the point of manufacture. You see, if you want to make pure nerve agent you’ve got to distil it. But distillation of these materials, on a large scale, is very difficult, and to my knowledge the Iraqis have never come close to achieving it. Personally, I think the dossier may be referring to mustard gas. We know the Iraqis are capable of making mustard gas of a very good quality, and that they knew how to stabilise it. However, I would stress we sampled and analysed all of the mustard gas that we came across, and, to my knowledge, we never found any that had been stabilised. It doesn’t mean there wasn’t any. It’s true that UN inspectors did find some mustard gas shells in 1998 and the analysis showed the quality was not too bad, but there was still no evidence of stabilisation. There is also evidence, as I mentioned at the start, that the Iraqis were moving towards the manufacture of nerve agents using what’s known as the binary process. This approach, which was first developed and used by the United States, means that you create and store two stable non-toxic materials, which when mixed together produce the lethal agent. The precursors are only mixed either immediately, before or even after the weapon is launched when they form the agent in flight. The quality of the agent produced by the Iraqi binary process was highly questionable. openDemocracy: Why couldn’t the Iraqis have restarted their programme? Ron Manley: It’s important to be aware of what that would actually involve. The sarin plant at Al-Muthanna, for example, was five storeys high and about 50 metres by 50 metres in size. To make nerve agents in a facility requires massive air filtration with a ventilation system capable of shifting and treating something like two million cubic metres of air per hour, if you don’t want to kill off most of the workforce very quickly. This is something that could be easily monitored. openDemocracy: They could build a small plant which would be less easy to detect. Ron Manley: Well yes, but then it wouldn’t be possible to make militarily significant quantities. You can make some in a fume cupboard if you got the capabilities, but then you’re talking about making grams. One shell holds roughly five kilograms. If you want 10,000 shells you’re looking at a lot of material. A single al-Hussein warhead holds 300 litres of agent. You can make 300 litres of agent in a fume cupboard, but it would take a very long time indeed. openDemocracy: What about VX, wasn’t that used at Halabja to massacre over 5,000 Kurds in 1988? Ron Manley: No. There are many debates about what was used at Halabja. My own view is that the Iraqis used an agent called tabun, which is one of the first of the nerve agents to be produced, by the Germans in the 1930s. Tabun is difficult to make. One of the final steps involves the use of sodium cyanide, and it is hard to remove this to obtain pure tabun. The Iraqis never did that successfully. Their tabun was therefore heavily contaminated with cyanide. According to several medical studies, some of the people who died at Halabja showed symptoms of cyanide poisoning while others were showing symptoms of nerve agent poisoning. This is what you would expect if the Iraqi forces used impure tabun. But that’s a personal opinion, nobody has ever confirmed exactly what was used there. Certainly tabun was used, but was it the only agent? Some say both tabun and mustard gas were used. Both are of an order of magnitude less toxic than VX and there is no evidence that the latter was used. UN chief inspector Hans Blix’s report says there may be something like three and half tonnes of VX we cannot account for. Iraqi scientists had told us back in 1992 that they had tried to produce VX, and succeeded in producing between two and three tonnes of very impure material; this is recorded in the UN inspections files. You have to understand the importance of documents in a regime of Saddam’s sort. The order comes down from on high saying ‘make me three tons of VX’. You do not go back and say, ‘Sir, we tried and failed’ because if you do, you disappear. Instead, you send back a memo saying, ‘Sir, we have produced your three tonnes of VX’. I know something about VX. The reason VX is not easy to produce is because the chemistry is incredibly difficult. I think the Iraqis never cracked the process to produce a good quality VX. Some, maybe, and it would, at best, probably have been no more than 50-60% pure and would have deteriorated very quickly. Even if they had made it by 1991 it would be absolutely useless by now. 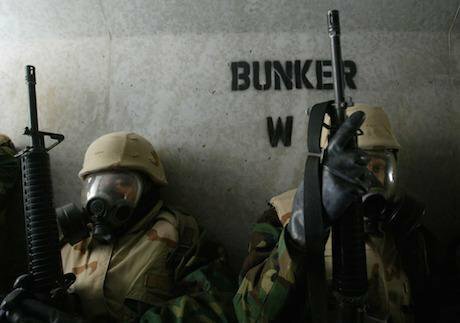 openDemocracy: And biological weapons? Did Unscom and later UN inspections find out about biological weapons capability in Iraq? Ron Manley: I should stress that I am a chemical weapons specialist. I do have some background in biological weapons (BW), but I’m not an expert. The UK biological weapons expert for Unscom, David Kelly, was reasonably convinced by 1992 that the Iraqis had had a biological weapons programme, but Unscom never determined just how extensive it was, even by 1998. I don’t have access to a lot of the more recent data. Even today there’s still debate about how extensive the programme was. Unlike chemical weapons, you don’t need a massive infrastructure to manufacture biological weapons – to make anthrax or botulinum toxin, for example. So BW is much more difficult to trace, and therefore much more difficult to deter. But the most dangerous thing we left in Iraq in 1994 when we finished the destruction programme was the people – the expertise capable of restarting the programmes. In my view, there’s no doubt at all that as long as Saddam and his regime existed they were going to pursue a chemical weapons programme if they had the opportunity. We spoke to the generals there. It was very clear. In the late eighties they were losing the war with Iran and it was only thanks to chemical weapons that they managed to stop the Iranian mass attacks. That was not a capability they wanted to give up. 5. Creating a credible chemical weapons convention. openDemocracy: Even when you left verification in Iraq you remained involved with chemical weapons and that country. Ron Manley: In the middle of 1993 I was approached by Ian Kenyon, who was then the executive secretary of the secretariat for the preparatory commission for the Organisation for the Prohibition of Chemical Weapons (OPCW). He asked if I would be prepared to join the secretariat and head its newly formed chemical demilitarisation branch. I said yes and joined the secretariat in September 1993. For a while I carried on as the chairman of the Unscom Destruction Advisory Panel and still went to Iraq along with some other members of the secretariat who had been involved with Unscom before joining the OPCW. But a number of the member states were not happy about there being a connection between Unscom and the OPCW. The non-aligned countries, for example, didn’t want to see the types of verification regime that were being implemented in Iraq adopted by the Chemical Weapons Convention. In Iraq, Unscom could do almost anything. There were virtually no constraints, and a lot of the member states felt that they didn’t want to see that approach replicated in the OPCW. Along with a number of staff from the secretariat I remained with the OPCW when the treaty came into force in April 1997. Its first director-general, José Bustani, asked me to become his special adviser. I accepted. In my last two years he asked me to become director of verification, and that’s where I was when I retired at the end of 2001.
openDemocracy: Were you involved in the negotiations to try and bring Iraq into the convention? Ron Manley: I was aware of them, but I was not directly involved and had retired before they had progressed very far. openDemocracy: And do you think the Iraqis were negotiating in good faith? Ron Manley: I don’t think Saddam’s regime did anything in good faith. One should not be under any illusion whatsoever: it was a dreadful, terribly oppressive regime, and Saddam did exactly what he pleased. A lot of people within the OPCW were ambivalent about Iraq joining. Although the secretariat did not find any evidence of serious non-compliance among the member states there were, nevertheless, some countries who believed that not all member states were in full compliance. The last thing we needed, therefore, was a member state that everyone was pretty sure was going to cheat. I’m not sure that even José Bustani was 100% sure whether he wanted them in or not. He could see the benefits, but he could also see the disadvantages. openDemocracy: José Bustani was obliged to stand down from leadership of the OPCW under US pressure. Was this because he might allow Iraq to join? Ron Manley: Bustani is very creative. He took a paper organisation and turned it into a solid reality. Unfortunately, I guess he did it too well for some. We created an organisation, which was more effective than the member states were ready for. Some of them started getting worried about that. I doubt that you will ever find anybody to admit that but it’s my personal view. In fairness the real problems for Bustani appeared to stem from the change of administration in the US at the end of 2000. Some blamed the American chemical industry, but I am sure that the problem did not lie with them. As director of verification at the OPCW I was in regular contact with the American chemical industry and found them to be fully supportive of the CWC. the Bush administration is not really interested in multilateral arms control regimes. It seems to me that the Bush administration is not really interested in multilateral arms control regimes. Perhaps they feel that the benefits are outweighed by the disadvantages – in other words, the impact on the US military programme and on their own bilateral negotiation process with other countries. A dynamic and intrusive OPCW may, in their view, not be compatible with this. So José Bustani had to go. They tried to change his approach – to get him to tone down, but you’re not going to change José’s approach to things when he thinks he’s right. On Iraq. It’s very clear that the Americans did not want the Iraqis in. Perhaps because they felt that it would interfere with their containment mechanism for keeping Saddam in place. There may well be some justification in that, for example if he became a member of the organisation, he would become subject to the verification regime from the OPCW, which is a much less stringent verification regime than the one applied under UN Resolution 687.
openDemocracy: But given what you know about the Iraqi regime, aren’t there some reasons for that position? Ron Manley: Absolutely. I have to say, even within Bustani’s own staff there were a number who were not sure that the benefits of having Iraq in would outweigh the disadvantages. But only the American Administration knows what their real reasons were for removing Bustani. Personally I think Iraq was a pretext rather than the real reason. I accept that they didn’t like what was happening between the OPCW and Iraq, and that was used as a reason to persuade the administration that maybe Bustani should go, but I think it’s much deeper than that, they wanted a different kind of organisation. openDemocracy: But the point is really that if you are seriously interested in making sure that there are not weapons of mass destruction which might get into the hands of terrorists, you would want the OPCW to really work and be intrusive. Ron Manley: Absolutely. But this US administration, for example, has largely opted out of the Comprehensive Test Ban Treaty Organisation (CTBTO); and it killed off the OPBW – the verification regime for the Biological Weapons Convention (BWC). I don’t think it will kill off the CWC because that would send too many bad signals, but I suspect that it would be quite happy if the CWC slowed down for a little while and provided it with the opportunity to achieve its aims in other ways. After all if Iraq had been a member of the CWC it would have been very difficult to actually go and throw missiles at it. My personal concern now is about the potential weakening of the verification regime. I think there is a tendency to try and cut back on the verification regime in some cases for the sake of costs but in others because it is more intrusive than some would like. I think the greatest thing about the OPCW has been its verification regime. It is vital to maintain it and even strengthen it further. Will it guarantee there are no chemical weapons? Of course not, but what it has done is to allow member states to get used to having international inspectors on their territory, visiting facilities and although it’s not perfect, it makes it much more difficult for countries not to comply.